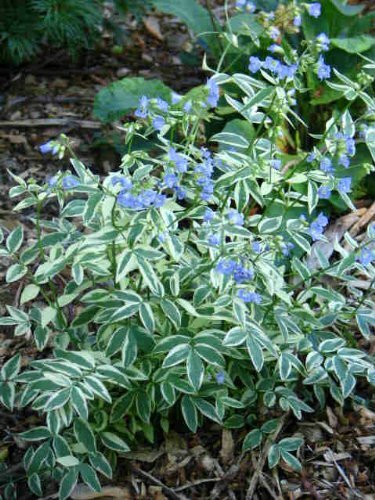 Polemonium reptans 'Stairway to Heaven' Partial to Full Sun Height: 12-24" Spread: 12-18" Zone: 3 to 8. Lavender-blue, 3/4", bell-shaped flowers are held above green leaves with white leaf margins tinged with pink in the spring. Blooms early spring through midsummer. Deadheading encourages re-bloom. Prefers a cool, moist environment. Protect from hot afternoon sun. Use as a specimen, in a border, a mass planting or as a cut flower.